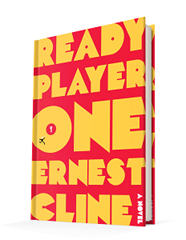 Published August 16, 2011, by Crown Publishers Ready Player One by Ernest Cline was his debut novel that submerges readers into fandoms and video game fun. Such a fun read for anyone who loves any fandom, science fiction, fantasy, dungeons and dragons, and the 80’s. If you are one who does not like any of those things, then you are not going to like this novel because the bulk of the novel, which is somewhat lengthy, is all about creating the OASIS not only for the characters but for the reader as well. That makes the bulk of the novel exposition because it explores everything that the reader may not be familiar to build the world. Moreover, then there is the OASIS. The OASIS is something society is just now imagining is possible with the sudden growth of augmented reality and the growth of VR. So the reader no longer has to suspend belief to imagine the possibility of the world, but on such a grand scale, there is so much that goes into building it. The OASIS is its own universe, and Cline treats it as such. So a lot is going into this novel to make it as grand and believable as possible. Now, as a story, outside the world building, it progresses exceptionally well. It moves slow, but again that mainly has to do with the world building. However, it moves and focuses on character development and the problems in the world. Moreover, that is what’s so riveting about the novel, how it tells a story and paints a very realistic story about a potential future. Overpopulation, famine, and the like, those are all very close to being a reality. In some places of the world it is a reality, so for the story to address that and incorporate it into the novel gives it some depth while also giving the reader something serious to think about between all the fun in the novel. Video games are a great escape, but that is all they are, an escape, one no one can be locked in forever. Problems do not go away, they have to be faced and dealt with, and the novel addresses that thoroughly. So the story progresses very well, it submerges the reader in the details without losing the fun edge, which is excellent. However, then there are the characters. Wade is a great character, and his tone captures the destitution in which he lives, while also capturing the hope and life he feels whenever he enters the OASIS. He has a strength to him that makes him a hero because he is willing to rise to the task, Wade makes a plan and makes the sacrifice he has to to make sure the good guys win. Wade is not without flaws of course. Wade thinks a little too naïvely, but he gets smart real quick, he makes mistakes but also learns from them. Moreover, his dynamics with his friends, they are also well constructed. They are fresh characters whom all have a fresh dynamic with one another, calling each other out on their mistakes and stupidity.